Mangalore has its own macaroon. It doesn't taste anything like what you would expect a conventional macaroon to taste like, but its a macaroon all the same. These Mangalorean macaroons are very similar to the German Wasp Nests that I made some time ago, and have the same texture and sweetness of those meringues, except that they are made with cashew nuts, rather than almonds. Pretty much every Mangalorean I know will instantly recall the taste (and price) of these macaroons, and remember them fondly. We used to buy them from Taj Mahal Sweets, and they were a delicious treat for special days. As kids, my sister and I loved it when Kitty Aunty (as we called her) came to visit, as we knew we were in for tons of treats. Aunty Kitty loved spoiling us, be it with ice creams from the famous Ideal's ice cream parlour in Mangalore or sweets from Taj Mahal or puffs from Venus Bakery. And of course, these macaroons, which she always loved to buy for us. Even when I was all grown up (some may dispute that fact, hehe) and heading to the UK, she tucked a small packet of these treats in my suitcase, so I wouldn't be deprived of them. I am lucky indeed to have such lovely aunties, and while I get to see them only rarely these days, I can never forget their huge influence on my life. I was inspired to try and make my own macaroons, after my friend Shireen mentioned that my wasp nests were very similar to these Mangalorean macaroons that we grew up with. And the more I thought about it, the more I thought, why not? I mean, I have already tried to recreate some of the tastes of my childhood like Bebinca, so macaroons aren't that much of a challenge by any stretch of the imagination. And of course, with Christmas coming up, it's a perfect time to be baking up a storm anyway. I mentioned in my first Christmas themed post, that I was looking to create a fusion of Indian/ Canadian and British Christmas traditions this year. And what better to start of with than these light, crisp and sweet bites with the crunch of cashew to remind me that I was, indeed, biting into one of my childhood favourites. I have no clue as to the origin of this Indian sweet. 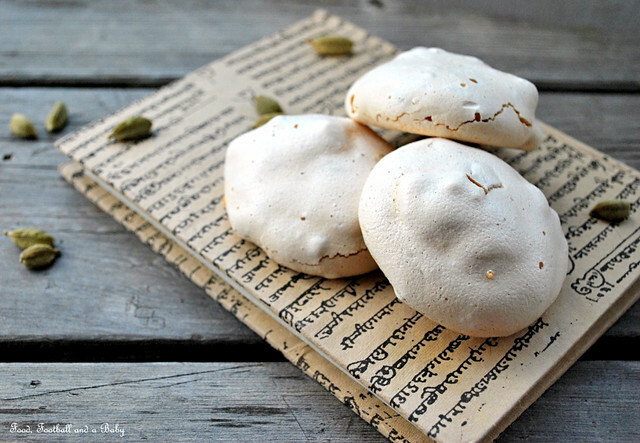 I can only imagine that they are an adapted version of meringues, but with the addition of Indian spices and cashew nuts. Mangalore produces and exports a fair amount of cashew nuts, so I think this was a sweet invented by their bakeries and subsequently popularised over the city. I looked around for some recipes, and there weren't many out there. The ones that did exist, confirmed what I'd suspected, that these macaroons were pretty much meringues, made with egg white, sugar and a touch of cardamom powder and cashews. So I decided to go my own way with these, and experimented a couple of times with different combinations of spices and nuts. I am sharing the recipe of the version I think comes closest to the taste of those Mangalorean macaroons. Of course, you can shake things up by changing the nuts and spices (cinnamon and pistachios, perhaps, or almonds and nutmeg, or coconut) but I wanted to keep things simple and reminiscent of my childhood. I hope you like these macaroons, and don't forget to let me know if you tried them and if you liked them. I enjoy hearing back from my readers, and its such a thrill when that happens. Until then, enjoy this super simple, but oh-so-yummy recipe. Preheat oven to 140 C or 275 F.
In a clean, very dry bowl, whisk the egg whites until they are very stiff. My method of checking is to turn the bowl upside down, if the egg whites don't slide, they are done. Little by little, add the sugar, beating well after each addition, until the sugar is all gone. I do it 2 tbsp at a time. Beat in the vanilla and the cardamom powder. Very gently, fold in the chopped cashew nuts. Macaroons cannot be frozen, but will keep well in an airtight tin for a couple weeks. Caster sugar is very fine sugar. I use the sugar labelled berry sugar here. To powder cardamom, take out the seeds of one green pod, then toast quickly in a hot pan for 30 seconds. Grind down to a powder using a mortar and pestle. I just chuck the cashews into a ziplock back, and give them a couple bashes with a rolling pin. Finally, the baking time given in this recipe will elicit a chewier macaroon. For a crisper version, bake for ten-ish more minutes, checking constantly on the macaroonx to make sure they don't burn. They look so good and love how you've photographed them on that book... really brings home the origin of the recipe. Beautiful! They sound great! 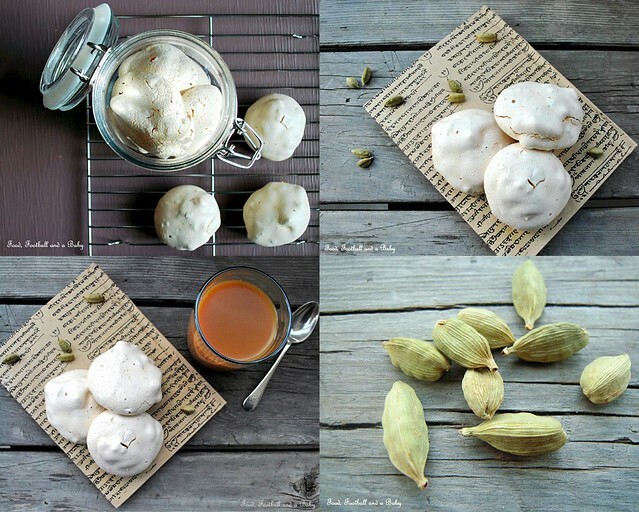 I love the idea of making meringue with spices... must try some time! They look fantastic. Am adding to my list of recipes to try out. They look great and lovely and light too. I usually make the Nigella ones with cardamom and rosewater which are more chewy than meringuey. 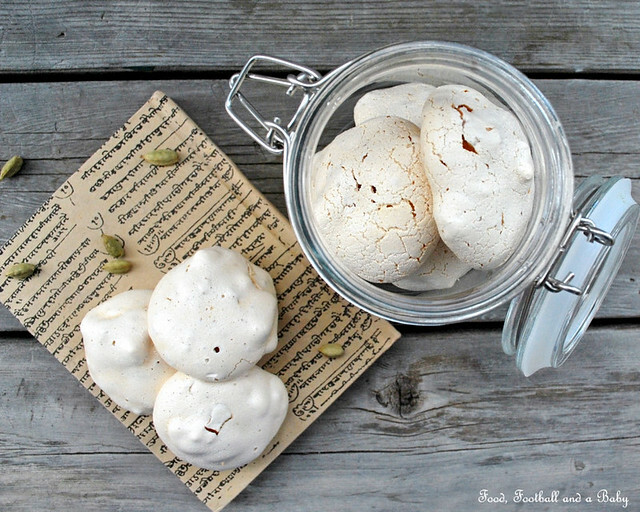 Thanks to Rebecca from @ChowandChatter I found this recipe and now your beautiful blog! Cardamom and cashews are 2 of my favorite things...and macaroons my fave cookie. Thus your recipe is brilliant! They look delicious. Would love for you to share this with us over at foodepix.com. Ok, first of all, these look delicious and your photos are beautiful! Second, this is kind of funny. I had my first "macaron" a few weeks ago after hearing how amazing they are from everyone and their dog. I was... underwhelmed. Loved the texture but I don't like the aftertaste of almond flour. They're only just starting to become popular here on the west coast and when I mention them to friends they think I'm referring to macaroons. And to us, a macaroon is a dense coconut treat. 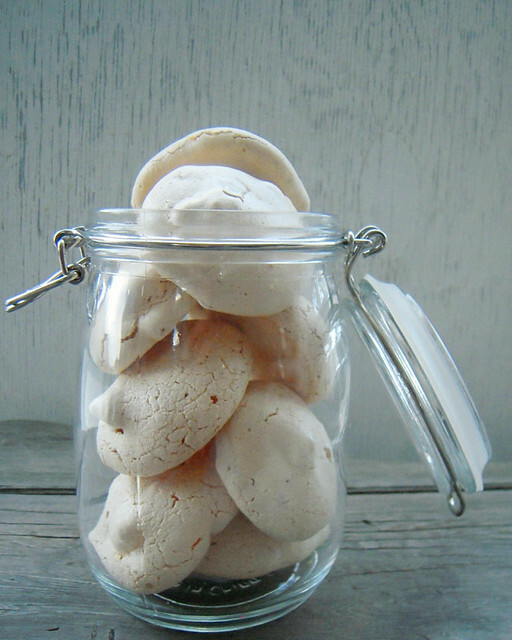 But then I see these and these are more like the macaron in that they're more meringue-y - but without the almond flour! So now I think I would like to try these. Funny how all these macaroon/macaron things are so similar but different! That's my rambling for today! My mom always made green ones with chocolate chip and mint for Christmas, and white ones with coconut in them. They were so yummy... the flavour profile of these appears to be DEADLY. I did laugh when I saw the careful attention you pay to powdering the spice. I have green pods, so I will try... but I also have cardomon powder. There must be a reason to do it this way and I bet it is all about the flavour... but the grinning was about the contrast to the care there and then the chucking the pistachios in a bag and whacking them with the rolling pin! What a contrast! It did make me smile! You are clearly a pro at making flavour combinations of food you can find here that reminds you of your home. It must be very hard to be so far away. I cannot imagine. Thanks for the suggestion, it is a great one! Can we replace egg ? ?